Myriad myRisk is a 35-gene panel that identifies an elevated risk for eight important cancers. Myriad myRisk® Hereditary Cancer is a scientific advancement revolutionizing hereditary cancer testing. Blending both genetic test status AND personal cancer family history, Myriad myRisk hereditary cancer panel represents the next generation of hereditary cancer risk testing. Hereditary cancer panel testing optimizes patient care through increased clinical sensitivity (mutation detection). Testing a broader number of genes associated with multiple cancer risks increases clinical sensitivity. For example, many patients have personal and family history that may be explained by more than one syndrome. One patient may meet Lynch syndrome criteria and another may meet HBOC syndrome criteria. 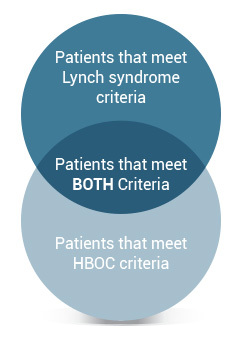 However, there are a significant number of patients that meet criteria for both Lynch and HBOC syndromes, among other risks. Myriad myRisk® Hereditary Cancer increases mutation detection by 40-50% in patients appropriate for HBOC or Lynch testing. The following case study illustrates a patient with a complex family history of cancer. A well designed hereditary cancer panel test will assess multiple genes with syndromic overlap, reducing the complexity of test selection so you can focus on optimizing medical management for your patient. Relying on single syndrome testing, the cost and time taken for multiple tests may have reduced the possibility of identifying this patient’s mutation. Learn why Myriad myRisk is the most accurate test for hereditary cancer panels. The easy to use, online Hereditary Cancer Quiz can help you identify appropriate patients for Myriad myRisk® hereditary cancer testing before or during your patient’s scheduled appointment. This tool can help you identify patients for testing, but it does not take the place of a full screening. All patients should be further evaluated to determine whether testing is appropriate. What does the Hereditary Cancer Quiz Do? View the Hereditary Cancer Quiz or request a customized version for your practice! The easy to use, online Family History Tool can help you identify appropriate patients for Myriad myRisk® hereditary cancer testing before your patient's scheduled appointment. This tool can help you identify patients for testing, but it does not take the place of a full screening. All patients should be further evaluated to determine whether testing is appropriate. What does the Family History Tool Do? View the Family History Tool or request a customized version for your practice!